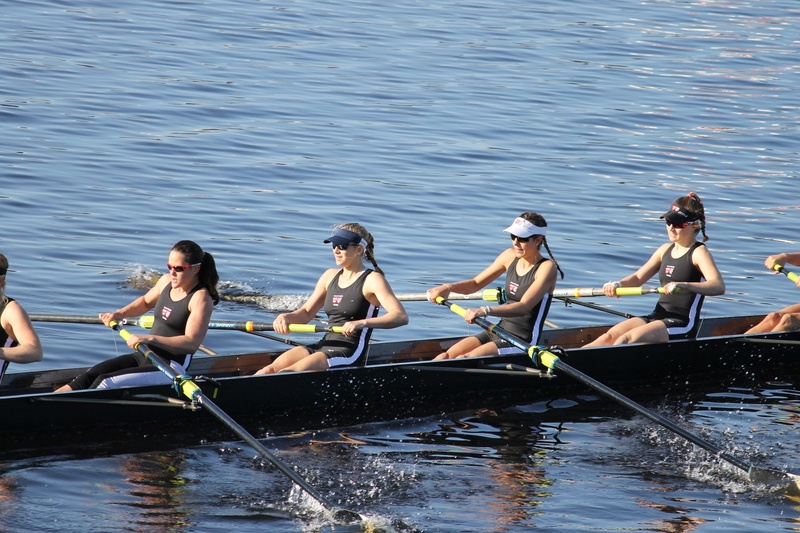 The Radcliffe lightweight crew, pictured last spring against BU and MIT, will look to get back to its winning ways this weekend. This weekend, all four of Harvard’s crews will take to the water to battle opponents in a full slate of competitive racing. In the case of the No. 13 ranked men’s lightweight crew, this weekend’s races will mark the beginning of the spring dual season. After strong performances at the National Championships last year, in which the second-ranked Crimson took the overall team’s points title and the varsity with no coxswain gold medal, the rowers of Harvard will take on Cornell and Penn on Saturday in Ithaca, N.Y. They will then plunge their oars into the Charles on Sunday for a matchup against Columbia and Georgetown. Cornell, in particular, will come to the line as defending national champions. Especially after an intensive winter and spring training campaign, the lightweight rowers will be raring to get off the line in a competitive atmosphere. Meanwhile, the No. 6 women’s lightweight crew team will look to rebound after last weekend’s losses, in which the team was upended by both No. 8 Georgetown and Bates. Radcliffe fell in all three varsity races as the Hoyas captured the Class of 2004 Cup. This Saturday, the Black and White will take on Princeton at Lake Carnegie in New Jersey in which the Class of 1999 Cup will be on the line. The waters will splash with the oars from crews of seven of the Ivy League programs Last year on the Charles, Radcliffe’s first varsity boat edged the Tiger’s crew by a mere 1.7 seconds. At the same time, the men’s heavyweight program will be traveling to Providence, R.I., to battle Brown after easing past Cornell and George Washington last weekend, including a finish in the varsity eight that was 10 seconds faster than the rest of the field’s. The Bears enter the contest after conceding the Albert Cup to Yale last weekend. More class cups will be on the line for the No. 16 Radcliffe heavyweight crew. After being edged by Brown by three seconds in the varsity eight last weekend, the team will join its lightweight counterparts on Lake Carnegie and will vie for the Class of 1975 Cup in the morning against Princeton and Cornell and then return to the water in the afternoon to try to capture the Class of 1984 Plaque against Princeton, Dartmouth, and Penn. The Tigers enter the races as favorites after winning the Class of 1975 Cup the past four years and maintaining a perfect record in the Class of 1984 Plaque. Sophomore coxswain Katherine Paglione said that the team is focused on the technical workings of its stroke going into the races on Saturday. Paglione said that the team will focus on each race individually and will not think too much about the class cups. The confluence of many Ivy League teams early in the season also provides a unique opportunity for the crew and will guarantee a week of intense rivalry across the conference. 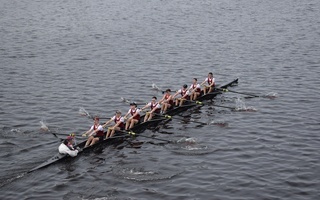 The men's lightweight crew team, one of four Harvard crew teams in action over the weekend, captured the Haines Cup for the sixth year in a row on Saturday. ​Both the men’s and women’s crew teams were back in action this weekend, taking on some of the top teams in the nation. Facing below-average temperatures and windy conditions, the Harvard teams were able to walk away with various victories as they look to build momentum for the home stretches of their seasons. In a busy slate filled with competitive racing for all four of Harvard’s crews, the lightweight squad made an especially bold statement to begin its season. In temperatures bordering on nippy, the No. 4 ranked lightweight crew faced four ranked opponents over the weekend, overcoming all of them.